If you think that skimming out debris and balancing the chemical levels in your pool’s water is enough, then you are forgetting a very integral part of maintaining your backyard oasis. Pool Decking is as important as the pool itself. It gives beauty and character to your oasis. And, like any other part of your home, it also needs maintenance. In a recent blog, we explained the different types of decking. In most cases, the materials used around the swimming pool can all use the same way of cleansing and repair to preserve your decking. Items – cleanser, pressure washer (preferably 2500 to 3000 psi), 15 to 25-degree spray tips, water hose. Remove any plant pots and furniture from the deck. Connect the water hose to the pressure washer. Give a quick spray around the decking to eliminate any leaves or other debris that interfere with the cleansing. Apply the cleanser in sections of the deck to make the job faster. Using a 15 to 25-degree spray tip, proceed to rinse out the decking. Repeat the process when needed. You can also prepare your own cleaning solvent. Use eight parts water, 1 part bleach and 1 part liquid dishwasher soap. The liquid dishwasher soap will help remove any greasy stain on your decking. Items – garden hose, bucket, sponge, liquid binder, dry deck repair powder, trowel. Take out the garden hose and rinse out the whole area; take additional time to clear any dirt from the crack. Remove any loose concrete particles in or around the crack. Use the liquid binder and the dry deck repair powder and mix it in the bucket. Carefully place the mixture into the crack until is filled. Finish and smooth the patch with the trowel. Damp the sponge and remove any excess remains around the crack. Continue using the same procedure for each crack. In the event of a more significant crack, use more mixture. 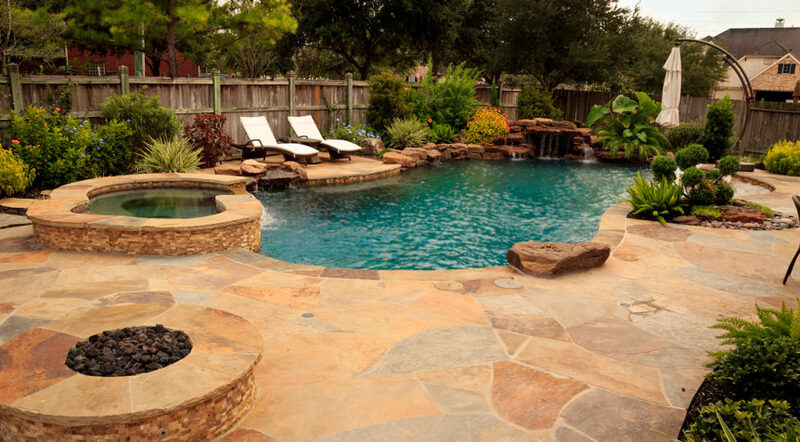 Platinum Pools has a team of experts that can guide you through the process. Give us a call at 1-281-870-1600 (Houston), 1-409-898-4994 (Beaumont), or 1-361-576-0183 (Victoria), or visit our page online for more information and free quotes.